Showing items in category Queensland, sorted by newest listed first. AUSTRALIA (Queensland) - 1905 1d rate postcard use to Tasmania used at THURSDAY ISLAND. 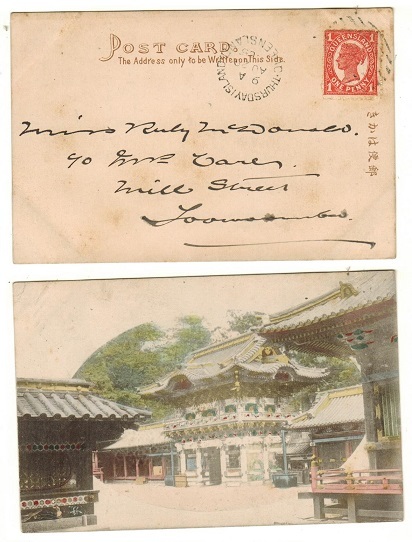 (THURSDAY ISLAND) - 1905 (AU.29) use of Japanese picture postcard addressed locally & bearing Queensland 1d adhesive tied by barred '336' duplex with THURSDAY ISLAND/QUEENSLAND cds alongside. (Turnbull type 2a). AUSTRALIA (Quensland) - 1907 2d rate cover to Tasmania used at THURSDAY ISLAND. (THURSDAY ISLAND) - 1907 (AU.19) cover to Tasmania bearing Queensland 2d adhesive tied by barred '336' duple with THURSDAY ISLAND/QUEENS- LAND cds at left. 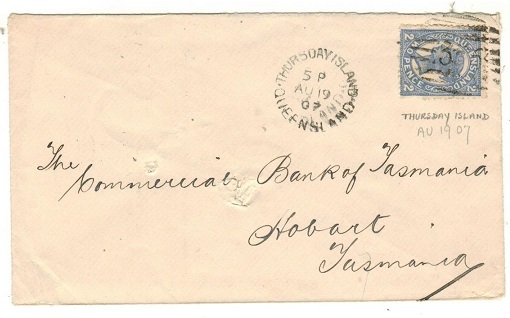 Addressed to the Commercial Bank of Tasmania & hence with central spike normally associated with such commercial mail. (Turnbull type 2a). AUSTRALIA (Queensland) - 1898 1 1/2d black PSC to Netherlands used at THURSDAY ISLAND. H&G 11. 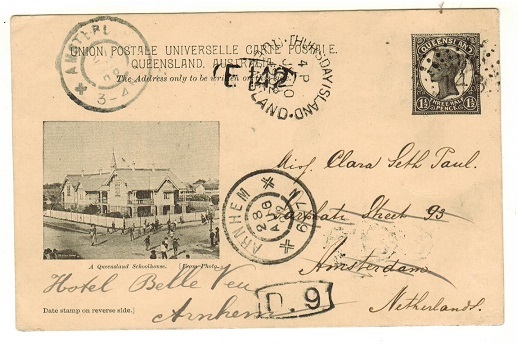 (THURSDAY ISLAND) - 1898 1 1/2d black on buff postal stationery 'view' postcard (A Queensland School House) addressed to Netherlands cancelled by dotted '148' strike with fine THURSDAY ISLAND/QUEENSLAND cds alongside dated JY.10.02. (Turnbull type 2a). H&G 11. AUSTRALIA (Queensland) - 1898 1d chocolate PSC to New Zealand used at THURSDAY ISLAND. H&G 10. 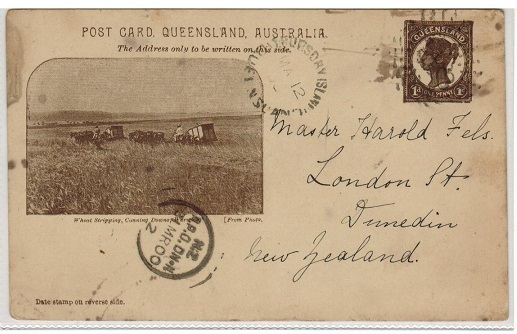 (THURSDAY ISLAND) - 1898 1d chocolate on buff postal stationery p'card to New Zealand depicting 'Wheat Stripping Cunning Downs, Warwick' cancelled by '148' duplex & with THURSDAY ISLAND/QUEENSLAND cds alongside dated MA.12.00. (Turnbull type 1b). H&G 10. AUSTRALIA (Queensland) - 1871 6d rate cover to UK used at ROCKHAMPTON. 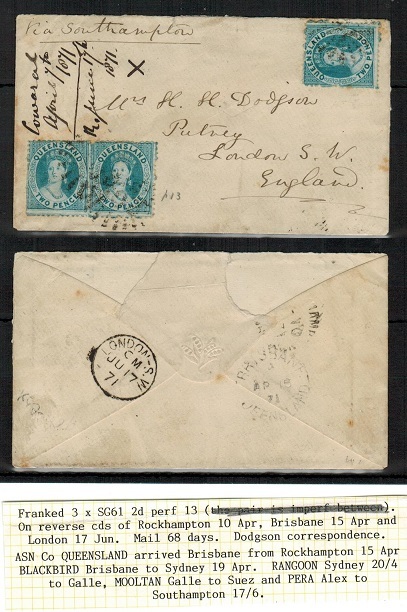 1871 6d rate cover addressed to UK marked 'Via Southampton' (piece of reverse flap torn away) bearing 2d blue single and a pair of the 'chalon' issue tied by 'sun burst' duplex cancellation and with BRISBANE transit b/s dated AP.15.71. AUSTRALIA (Queensland) - 1872 6d rate cover to UK used at BRISBANE. 1872 (MR.22.) 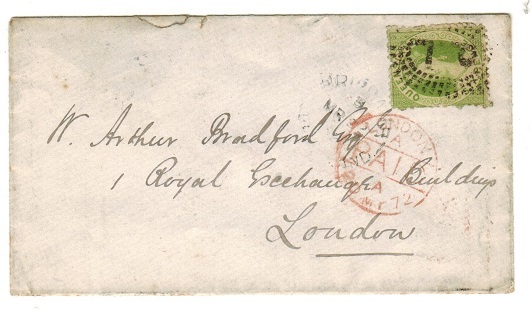 cover addressed to UK bearing 6d yellow green adhesive tied by barred star ray ' Q.L.' cancellation with light BRISBANE code B cds alongside. Red LONDON/PAID arrival dated 20.MY.72. AUSTRALIA (Queensland) - 1889 3d violet PSC unused. H&G 6. 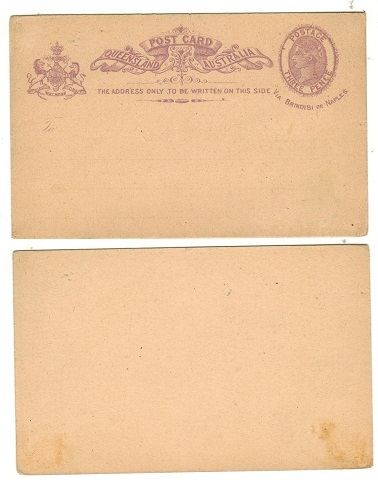 1889-91 3d violet on buff postal stationery postcard with additional 'Via Brindisi or Naples' inscription in unused condition (small mark on reverse side). H&G 6. AUSTRALIA (Queensland) - 1889 2d blue PSRC unused. H&G 5. 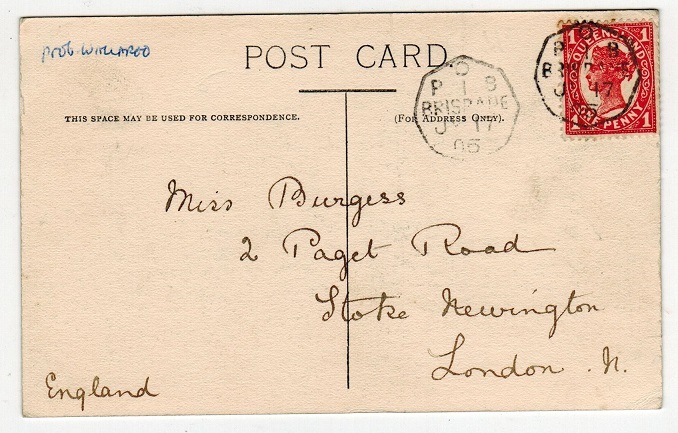 1889-91 2d Blue on buff postal stationery postcard with additional 'Via Direct Route' inscription in fine unused condition. H&G 5. AUSTRALIA (Queensland) - 1880 1d salmon PSC unused. H&G 1b. 1880 1d Salmon on buff postal stationery postcard. Fine unused. H&G 1b. AUSTRALIA (Queensland) - 1897 1/2d IMPERFORATE PLATE PROOF strip of three. 1897 1/2d (SG type 20) IMPERFORATE COLOUR TRIAL vertical strip of three printed in the issued colour of deep green on ungummed paper. AUSTRALIA (Queensland) - 1889 1d PSC used at BUNDABERG. H&G 9. 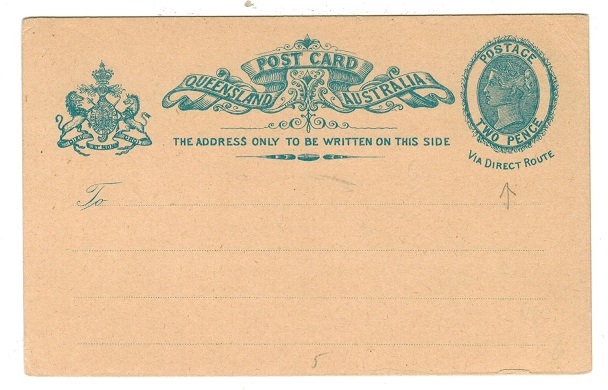 1889/91 1d rose on greyish buff postal stationery postcard addressed locally and cancelled by '148' duplex with BUNDABERG/QUEENSLAND cds alongside dated OC.12.91 code 9. H&G 4. AUSTRALIA (Queensland) - 1881 1d PSC used locally from BUNDABERG. H&G 3. 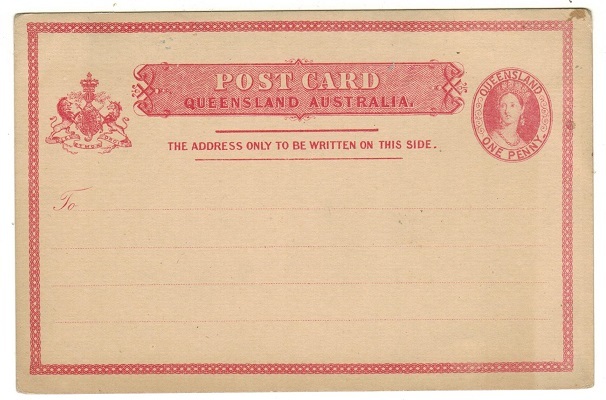 1881/86 1d lilac red on cream postal stationery postcard addressed locally and cancelled by BUNDABERG/QUEENSLAND cds dated SP.22.88. H&G 3. AUSTRALIA (Queensland) - 1888 1d 'O.S.' unused official PSE. H&G 3. 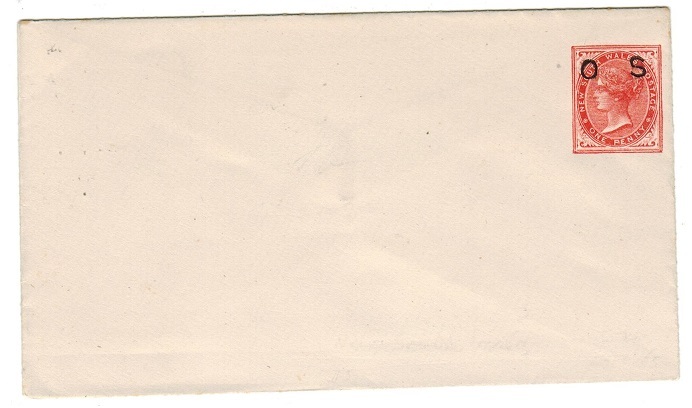 1888 1d Brick red on white postal stationery envelope in fine unused condition with 'O.S.' ovpt. H&G3. AUSTRALIA (Queensland) - 1883 2d 'O.S.' official unused PSE. H&G 2. 1883 2d blue on white 'O.S.' 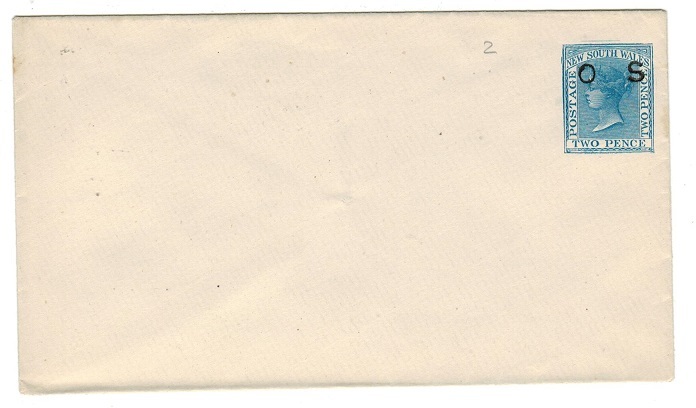 official postal stationery envelope in fine unused condition. H&G 2. AUSTRALIA (Queensland) - 1870 2d rate 'chalon' cover to Broad Sound. 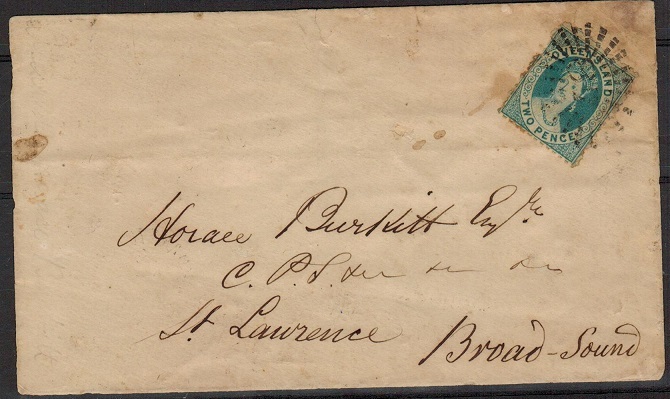 1870 cover addressed locally to St.Lawrence, Broad Sound bearing 2d 'chalon' and tied by a 'sunburst' numeral '87' cancellator with IPSWICH 'proving' backstamp dated AP.25.1870 and with BRISBANE transit and BROCKHAMPTON arrival b/s. The cover has a light'water stain at the top right corner and the flap has a few faults from rough opening. 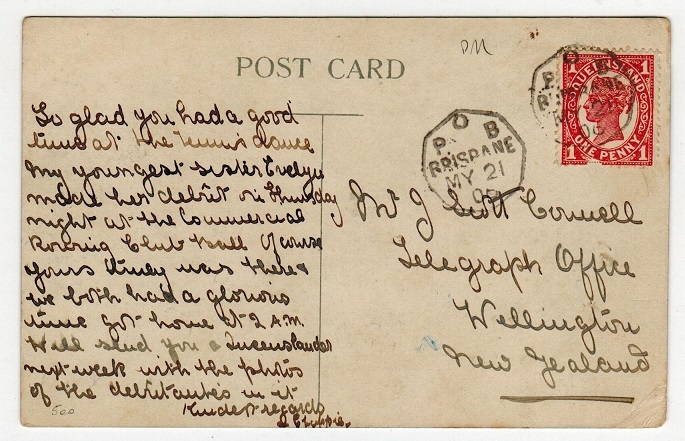 AUSTRALIA (Queensland) - 1907 1d rate postcard with 'P B' (code 2) strike. 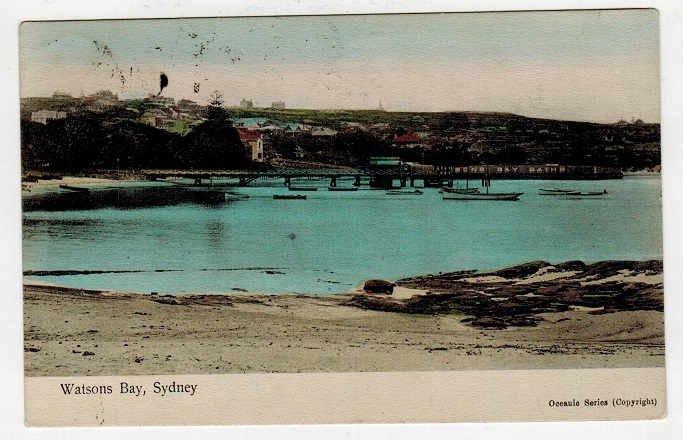 1907 (AU.26) use of picture postcard addressed locally & depicting 'Watsons Bay, Sydney' & bearing 1d adhesive tied by octagonal P.2.B.BRISBANE post box cancel with 'X' code designated to interstate mailings. 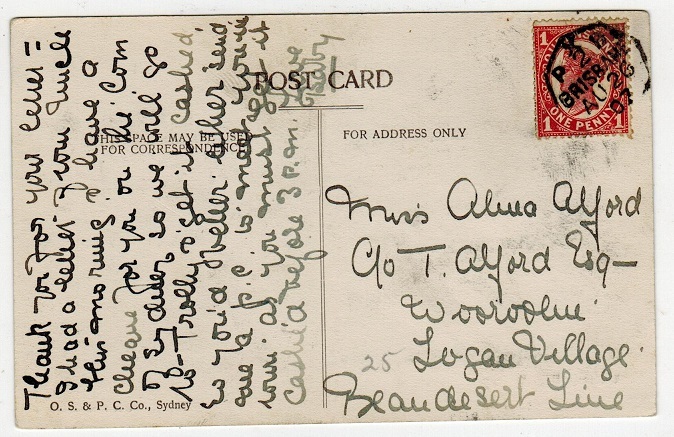 AUSTRALIA (Queensland) - 1905 1d rate postcard with 'P B' (code 1) strike. 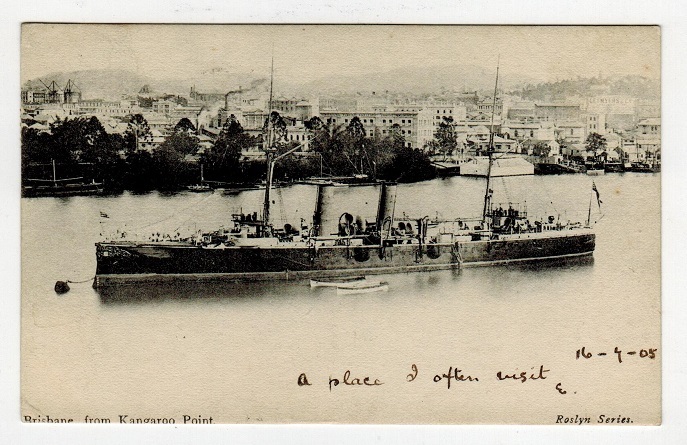 1905 (JY.17) use of picture p'card to UK depicting 'Brisbane - From Kangaroo Point' (Large Steam Ship on river) bearing 1d adhesive tied by octagonal P.1.B.BRISBANE post box cancel with 'O' code for overseas mailing. 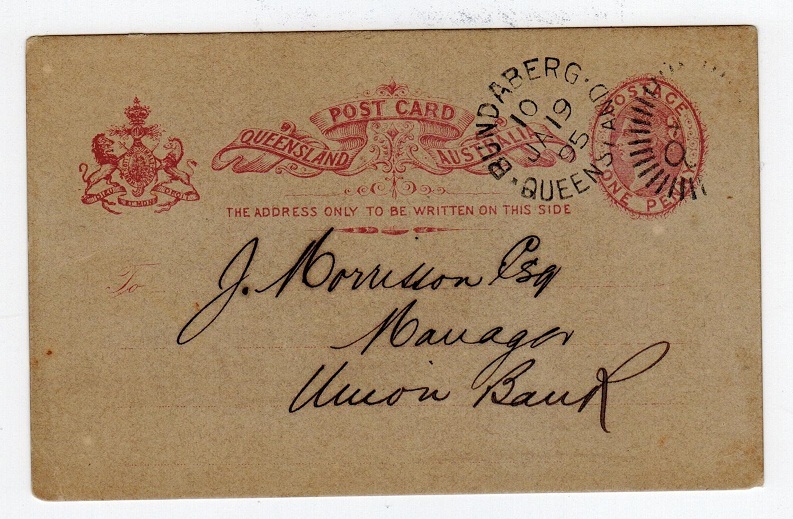 AUSTRALIA (Queensland) - 1906 1d rate postcard with 'P B' strike (no code). 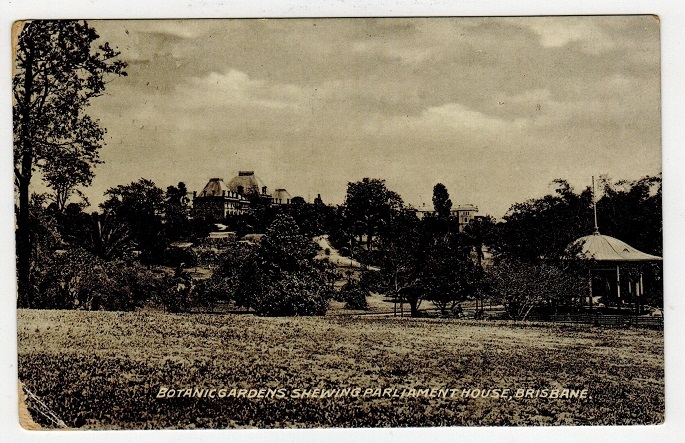 1906 (MY.21) use of picture postcard to New Zealand depicting 'Botanical Gardens showing Parliament House, Brisbane' bearing 1d adhesive tied by octagonal P..B. BRISBANE post box cancel with 'O' code for overseas mailing. 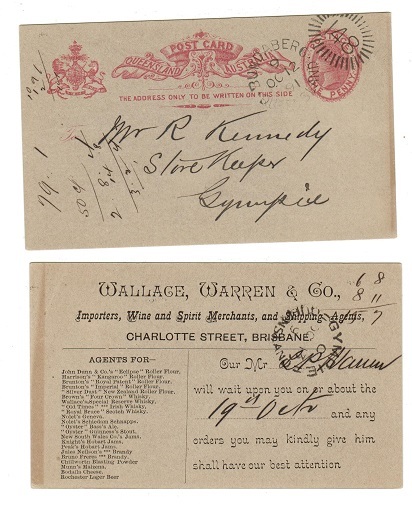 AUSTRALIA (Queensland) - 1892 1/2d postal stationery wrapper uprated to UK. H&G 1. 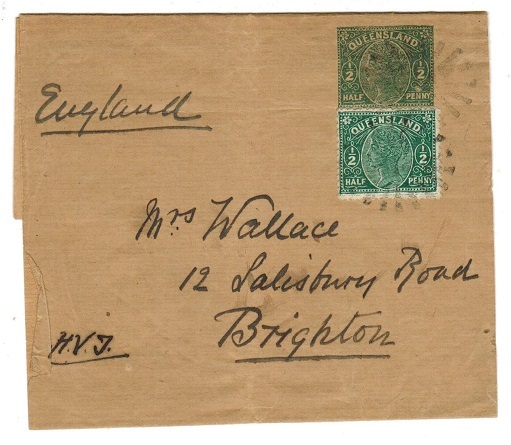 1892 1/2d Green on buff postal stationery wrapper addressed to UK bearing additional 1/2d (SG type 15) cancelled by starred barred duplex. H&G 1. AUSTRALIA (Queensland) - 1882 1/- dark brown 'Electric' TELEGRAM form unused. H&G 1. 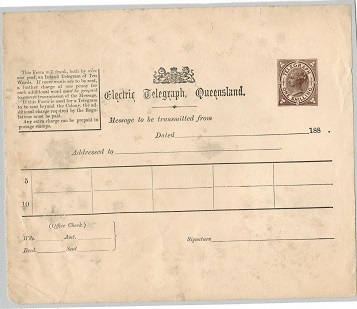 QUEENSLAND - 1882 1/- dark brown on cream ELECTRIC TELEGRAPH QUEENSLAND telegram form in unused condition. H&G 1. A few age marks but very scarce. AUSTRALIA (Queensland) - 1889 2d blue PSC unused. H&G 5. AUSTRALIA (Queensland) - 1930 3d,4d,6d and 2/- 'Impressed Duty' IMPERFORATE PLATE PROOFS. 1930 3d, 4d, 6d and 2/- IMPRESSED DUTY issue IMPERFORATE PLATE PROOF examples printed in dark blue on ungummed and unwatermarked paper. (4 proofs). AUSTRALIA (Queensland) - 1930 1/6d 'Impressed Duty' IMPERFORATE PLATE PROOF. 1930 1/6d IMPRESSED DUTY issue IMPERFORATE PLATE PROOF printed in light turquoise blue on ungummed and unwatermarked paper. AUSTRALIA (Queensland) - 1930 1d 'Impressed Duty' IMPERFORATE PLATE PROOF. 1930 1d IMPRESSED DUTY issue IMPERFORATE PLATE PROOF printed in dark blue on ungummed and unwatermarked paper with black positional lines on front and reverse. Possibly ex mapping paper. 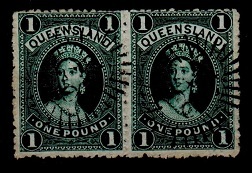 AUSTRALIA (Queensland) - 1882 £1 deep green pair cancelled '148' at BUNDABERG. SG 156. 1882-95 £1 deep green (perf 12) adhesive in a superb horizontal pair cancelled by '148' ray oblitorator on each used at BUNDABERG. A lovely rich colour. SG 156. AUSTRALIA (Queensland) - 1889 1d PSC used at BUNDABERG. H&G 4. 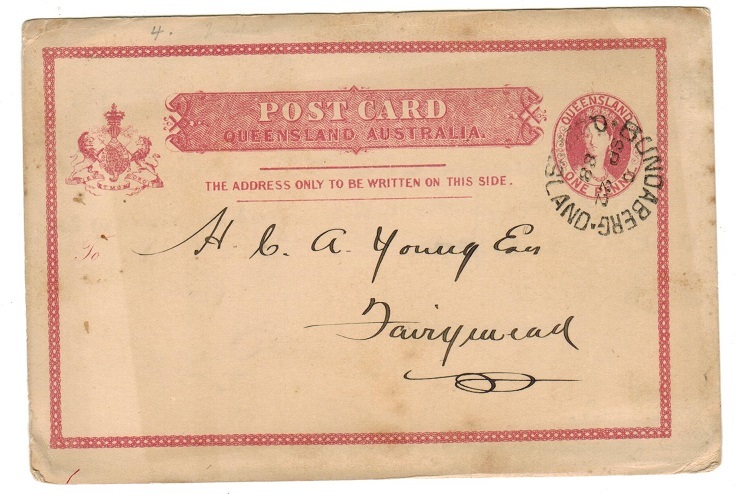 1889/91 1d rose on greyish buff postal stationery postcard addressed locally and cancelled by '148' duplex with BUNDABERG/QUEENSLAND cds alongside dated JA.19.95 code 10. H&G 4.